As you might of guessed this coming week my family is ACTUALLY doing something for Easter. Not since I was 7 did we ever do something as family for Easter. It was mainly my mum taking me to Easter show so I could purchase an insane amount of candy and novelty trinkets that seemed so important at the time; only to be used and broken within a week. Ah.. the memories. However, the only reason why we are putting in the effort is because of one very special little girl. You have probably seen the many cakes I have made my darling little niece. My family have done a lot of out of character family celebrations ever since my sister had a baby. Not that I am complaining, I really love the fact it has brought us together. I maybe experiencing the side effects but for some strangle reason this bonding is fulfilling the lack of family time in my teenage years. Did I ever mention that I was a very antisocial, angry teen too? So this is a big change for me. Like most families, we do not resemble the Brady bunch. There might be three daughters but only brothers I have are the one my sister’s made their husbands. While the relationships between our families has progressed enormously, it was not always this casual. In fact, the distance between my middles sister’s in-law and my parents was slightly frosty; I am putting it down to awkwardness and a lack of conversation starters. For any of you who have recently had a baby enter the family or get a new niece, nephew or cousin; How many times have you celebrated, complete out of the blue, “Their first” event or celebration? An example? My first 100 days, my first dress up party, My first Easter, my first bath. The list goes on. Some have gone as far my first solids party; but that is another story. Are these events in your life because a new little one helping you develop better bonds in your family? I would love to know if you have experienced this too! Also leave your ideas for things families at family gatherings do. It may seem a bit dumb; but I really have no clue how to go about family time these days. On a side note: It must be so exciting for her but what about the year after? It must be so disappointing for babies once they past one. Well they may not know they are disappointed but once you have turned one, there are significantly less parties and gifts which come your way. Anyway, enough of my blabbing about family thoughts and on to these Brownies. Now you might be all eating egg shaped, bunny shaped or chicken shaped chocolates right now but for me I have never really got into Easter eggs. Sure they are perfect to look at and I am looking forward to sale after wards however even though it is the same chocolate; I do not enjoy it as much…. Yes, shaped chocolates do not make me a happy chocci-mite. I would rather square (or half a block) of that same chocolate. I have fallen in love with the crackle or the wrapper and the perfectly shaped rectangle with those little squares. Charlie and the chocolate factory is my picture perfect movie (well the number of chocolate blocks is). Well if you are like me; I will turn that Easter chocolate into something I would rather eat. 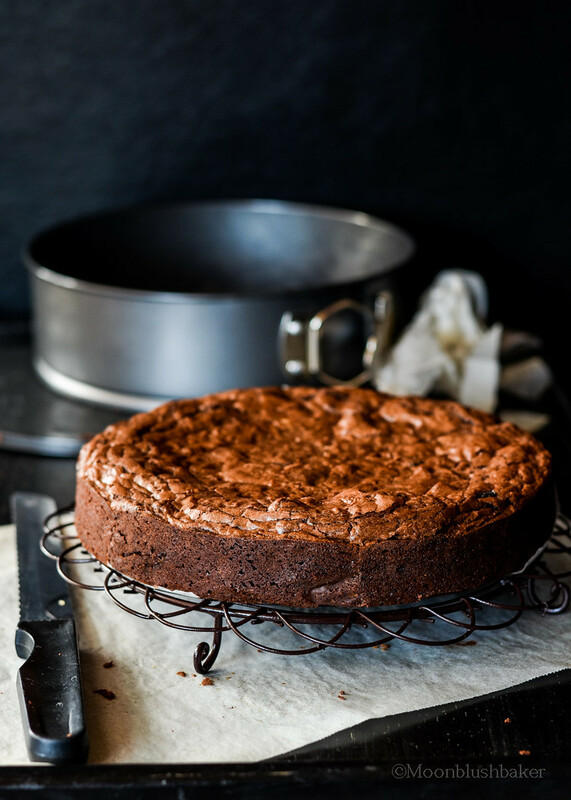 Brownies are ridiculous easy, taste phenomenal with a small list of ingredients and most important, are up their with one of fave desserts. This is coming from someone who is very picky about chocolate cakes; they must not be sweet but bittersweet. Have a hum of spice and cocoa laced; no powder stuff here, just pure dark chocolate. I am impartial to adding extras in to brownies, they are delicious as they are, but this time I am going rouge. 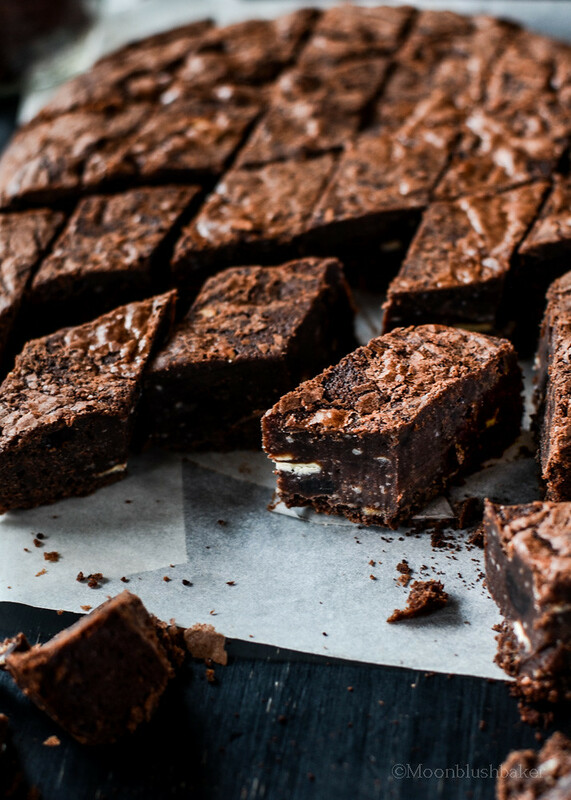 You know the only thing I could make brownies more addictive is add coffee and alcohol. Yep I have made the most addictive substances in to one dessert…. A triple threat in other words. For those of you going into summer will hate me. Anyway this is base of a really simple formula for crackly top, coffee crunch brownie bars. I know I baked in a round tin but here me out I was too lazy to find a new rectangle pan. 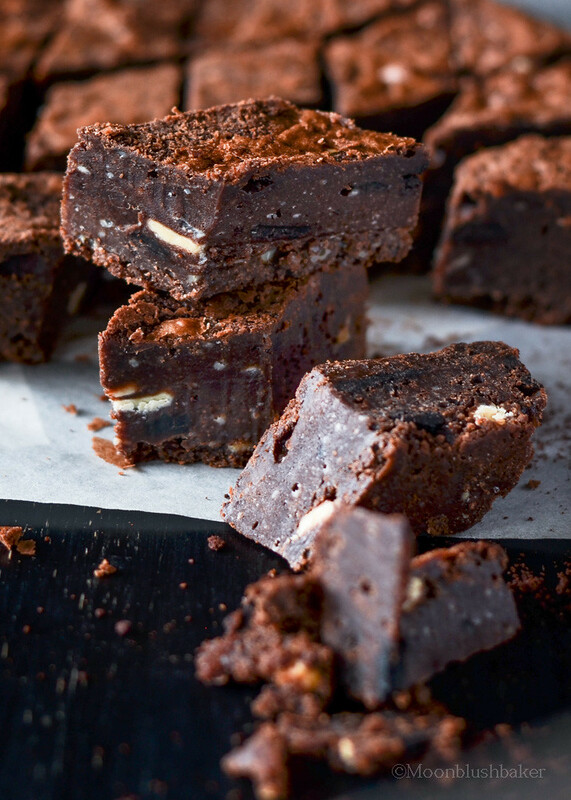 These brownies are rich, fudgy with the subtle crunch of crushed white chocolate covered coffee beans. I used Tia Maria here to add extra flavour but you do not have to. Pre heat oven to 160C. Line an 8 inch square tin with greased foil. Set aside. In a large saucepan melt together butter and chocolate stirring occasionally until combined. Stir in sugars and salt. Cool for 5 minutes. Whisk in eggs one at a time. Stir in flour and liquors until combined. Fold in white chocolate coffee bean pieces until fully combined. Bake for 25-30 minutes until the edges are set but the middle is slightly underdone. 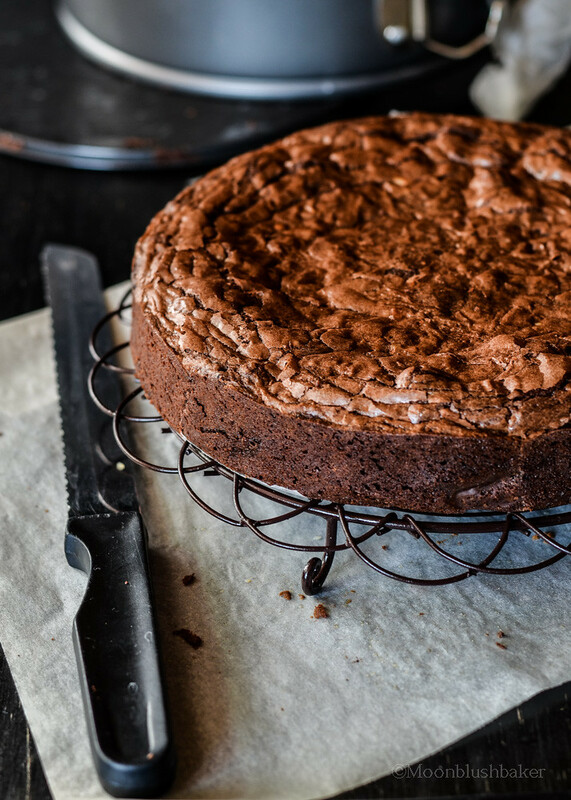 Another way of telling is to push your finger gently into the brownie edge; if ready it will be springy. This looks SO amazingly delicious! I think I’m making this for Easter – thanks! gorgeous photos! Thanks Mary. It means Lot that you love the photos here. What I would GIVE for a whole batch of these in front of me right now. So much yum, lady! Thanks love. I would gladly send some to over the ocean if I could! Wow, this looks divine! Thanks for sharing. Thanks Leelee. 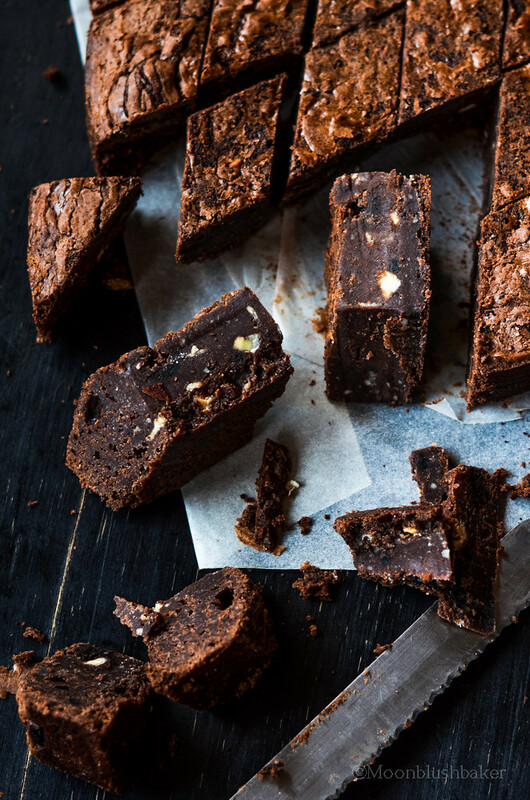 They certainly are brownies to try this weekend. The round pan was a great idea. And cutting on the diagonal works, too. Thanks for sharing. Thanks George! Happy to share brownies anytime. How can you go wrong with these, even the name sounds great. Anyway about the family thing, I think it’s nice your all celebrating together especially over your little niece. Happy Easter. Happy Easter Cheri! 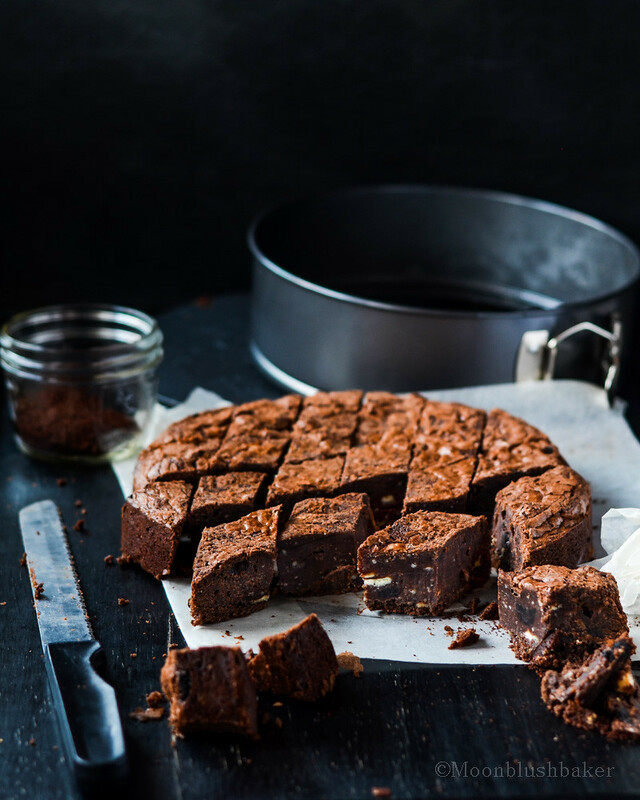 I am sure you could do these brownies with your family too this week. They will love you for it! Wow, this looks fantastic! I’m totally drooling right now. Do you have any recommendations to substitute for the white chocolate coffee beans? You may use Whole roasted coffee beans and white choc chips if you can not find them. Another option is coffee toffees/ lollies and white choc. I hope you try them because yes they are drool worthy! I’ve had this post open in a tab for a couple of days nw and every time I go to do some uni work I somehow get side tracked by this page and ed up staring at the brownie. I’m not even joking I wish I could bring myself to close the damn tab! I love everything about these, right down to the way you’ve sliced each piece! Truly beautiful. We’ve not been much of an Easter family since we grew up, I cant wait for it to be made into more of a fuss when theres baby’s involved! Your comment made me laugh so hard because I use to do that too when I was in Uni! I was on food blog sites while doing homework or in tuts. Good times. Your comment is making me blush, I am so glad you love these photos! Thanks Love! I really like how you cut this brownie! 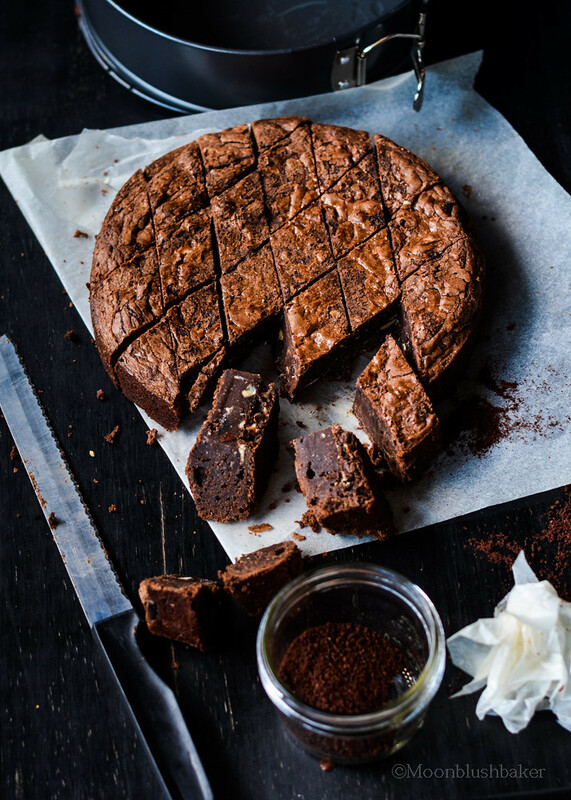 Instead of squares, your way of cutting brownies have more dimension and fun! It looks so delicious. Haven’t had really good brownie for ages!